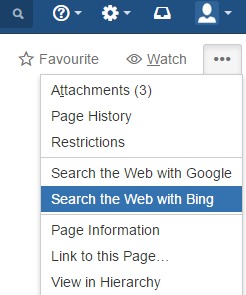 Web sections can be used to add new locations, or sections, to add web-items (links, buttons etc). 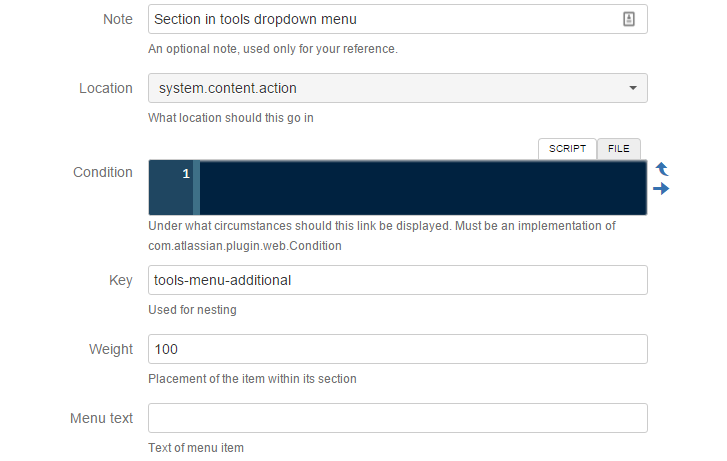 This will create a new web section in the ellipsis dropdown menu of wiki pages. Note that the web-section will be not visible unless any there are any web-items in it. Modify the Web Items simple link example to change the section to the one created above. The full name will be the location plus / and the key. So in this case it should be system.content.action/tools-menu-additional. In the following screenshot I created a similar one that searches for the current page title or issue summary with Bing rather than Google. It should then look like the picture below. As you can see, both items are grouped into their own session. Play around with the web section weight to move the section up or down in the menu. As with web items, you can define a condition that will determine whether the entire section will be visible or not.